Today I deleted my Facebook, Twitter and LinkedIn accounts. It’ll be 30 days before it’s a permanent decision. And yes, I did this once before. They’re addicting, and I don’t want to be addicted anymore. I also believe their businesses are morally reprehensible, dependent on exploiting human psychology. But you can always reset your password so you can’t log in. I did that. It’s like locking the alcohol in a cabinet that you still have the key to. Blogs are cooler. You should blog too! Let’s put it this way: if you can build a $100 billion company by using the Internet to replace the college yearbook — imagine what you can do if you use the Internet to replace college. 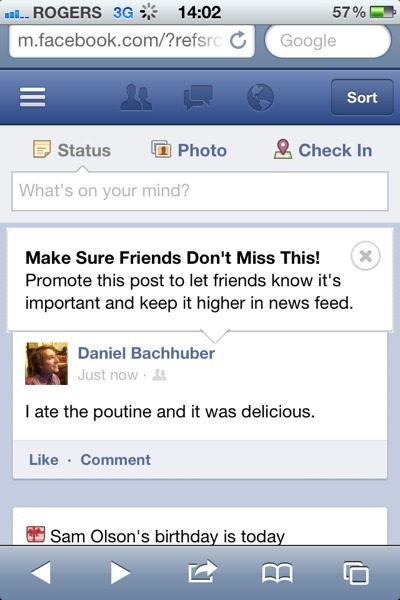 Exclusive: Leaked Details of How Facebook Plans To Sell Your Timeline to Advertisers. There’s no FCC policy for sponsors paying to change the algorithm. What Facebook knows about you. I’d love to see the full extent of the data set, and every web application should provide this level of transparency. Facebook To Launch A Subscribe Button For Websites. “It’s like RSS, except Facebook gets to own you and your subscribers.” — Les Orchard. For publishers, please see exhibit A, exhibit B, and exhibit C.
Asking computer nerds to design social software is a little bit like hiring a Mormon bartender. We have a name for the kind of person who collects a detailed, permanent dossier on everyone they interact with, with the intent of using it to manipulate others for personal advantage – we call that person a sociopath. And both Google and Facebook have gone deep into stalker territory with their attempts to track our every action. Even if you have faith in their good intentions, you feel misgivings about stepping into the elaborate shrine they’ve built to document your entire online life. Open data advocates tell us the answer is to reclaim this obsessive dossier for ourselves, so we can decide where to store it. But this misses the point of how stifling it is to have such a permanent record in the first place. Who does that kind of thing and calls it social? I deactivated my Facebook account last week, accidentally clicked on a Facebook link today, and it automatically logged me back in. Creepy. Initiating two week deletion countdown. Facebook is crack to journalists and pushers like Nieman Lab aren’t helping their addiction. Publishers: own your technology, user experience, and data. Quit sharecropping on others’.